Last weekend V and I took the opportunity to escape the city and go camping. Our plan for the trip was to just enjoy campfires, trout fishing and nature for a couple of days. Originally we were going to take a trip to Elora Gorge but with the expected bad weather, we opted for a site over at MacGregor Point provincial park instead. From downtown Toronto, it’s about a 3 hour drive with traffic, though once you get past Brampton things really clear up. Once we were out of the major metropolitan areas we were able to enjoy vast countryside and fields of southern Ontario. I grew up in Western Quebec so I’m used to some farmland followed by massive jutting rock faces. A nice thing about changing our booking over to MacGregor Point is that alcohol was permitted on site. All the sites at Elora are pretty close to the gorge, so I figure it’s more of a safety reason than anything. On our way we grabbed a couple of beers each, the GLB Canuck and Railway City Witty Traveller. Both were fine beers for camping, and the Witty Traveller had a nice amount of coriander that was wonderfully quenching. On Saturday we opted to go fishing near Denny’s Dam Conservation area. 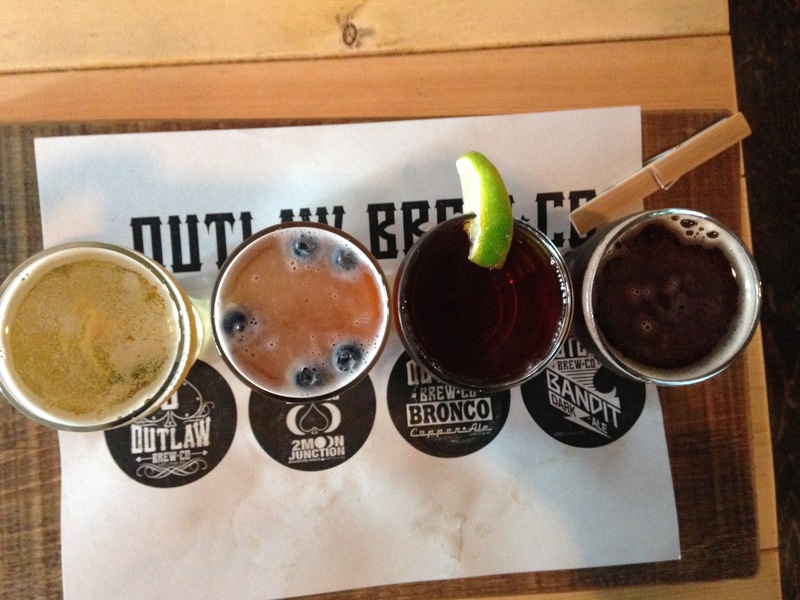 While passing through Southampton, I saw “Outlaw Brewing Co – Saloon and Microbrewery” and took note of it. We hadn’t even tried fishing yet, and besides it was 9am so they wouldn’t be open anyway. Their signature beer is the Outlaw Lager, which is crisp and clean with some sharp bitterness. Unfortunately, my nose was all out of whack from a cold so I couldn’t pick up too much aroma from it. You could tell that they had nailed this one down, it was the most outstanding beer from the flight that we tried. Up next was their 2 Moon Junction Blueberry Wheat beer. It was served with blueberries added to the finished product, which were a nice touch and I know that this is something Pump House Brewery does with their Blueberry Ale. The blueberry notes were there, and could be accentuated by biting down on a blueberry along with some of the beer but it was enjoyably subtle. I’ve had other blueberry wheat beers recently that were very forward with the fruit that made it hard to have more than a single pint, though this offering was subdued enough that one could enjoy several. Third was their Bronco Copper Ale, which was for some reason served with lime. It was a little strange, and the first thing I removed when going to smell it. The lime really messed with picking up any other aromas from the beer. Of all the beers, this was the least impressive in my opinion. The server told us that it was a very bitter bitter, though not at the level of what you’d find in an IPA. I’d agree that there was really bitter though there wasn’t much of a hop aroma. Much of the aroma I detected were from the darker caramel malts. Finally we had the Bandit Dark Ale, though it wasn’t much darker than the Copper Ale, though this was much more enjoyable. It tasted more balanced which made it very easy drinking than the previous beer. There were some floral notes from the hops, along some biscuit and roasted notes from the grains. Their menu was very simple, offering some burgers, wraps and salads which were all fairly priced at around $15.00. 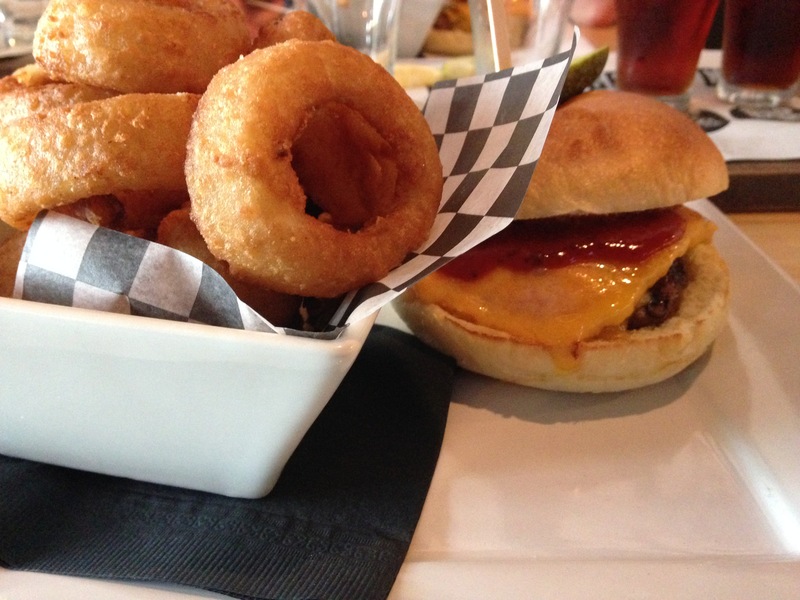 We decided to go for the cheese burger topped with back bacon and were pleasantly surprised. Either the bacon was smoked with maple, or there was maple syrup in the bbq sauce but it was excellent! We weren’t expecting much from a small town in rural Ontario, but we were pretty surprised. If you are ever going to be in the area for camping or whatnot, I’d suggest checking the place out. Honorable mention to Elora Brewing Co. and their delicious IPA and Lager. Some good beer coming from the “sticks”, too! Definitely worth exploring when you’re out and about.